An F-35A seperates from formation to land at Mountain Home Air Force Base, Idaho, for a training exercise June 6-17, 2016. Mountain Home AFB’s airspace allows Hill Air Force Base’s active duty 388th Fighter Wing and reserve 419th Fighter Wing to fully test the aircraft in preperations for declaring initial operational capability later this year. The first deployment exercise for the F-35A Lightning II confirmed that the Air Force’s newest fighter jet is on track to reach initial operational capability later this year. A declaration of IOC means the F-35A will be combat ready. Seven F-35A aircraft and 181 personnel from Hill’s active duty 388th Fighter Wing and Reserve 419th Fighter Wing pushed the aircraft to its limits at Mountain Home Air Force Base, Idaho, during the training June 6-17. The simulated deployment tested the F-35A against a stringent set of IOC requirements to include basic close air support, aerial interdiction and limited suppression and destruction of enemy aircraft. While at Mountain Home, Hill’s pilots and maintainers achieved a 100 percent sortie generation rate with 88 of 88 flights and a 94 percent hit rate with 15 of 16 bombs on target. Maintainers achieved 92.3 percent Mission Capable rate. 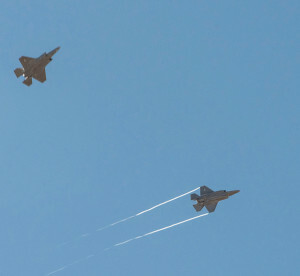 Hill’s F-35A pilots flew large-force exercises with F-15Es from Mountain Home’s 366th Fighter Wing and remained undefeated during air-to-air engagements against red air, or “enemy” aircraft. The Autonomic Logistics Information System — the aircraft’s complex information technology infrastructure known as ALIS — and the mission systems software performed very well, according to Capt. Richard Palz, 34th Aircraft Maintenance Unit, officer in charge. A small team of Lockheed Martin contractors provided ALIS and logistics support just as they would during real-world deployments and their spare parts and logistics support was excellent, Lyons said. Known for its highly advanced stealth capability, the F-35 is the world’s most advanced multi-role fighter and is designed to gather, fuse, and distribute more information than any aircraft in history. It can penetrate enemy territory that non-stealth aircraft such as the F-16, A-10, and F-15 cannot. The Air Force’s first operational F-35A arrived to the 388th FW’s 34th Fighter Squadron here in September 2015. Hill AFB now has 21 pilots and 106 maintainers who are qualified on the F-35A. In February, Hill F-35A pilots dropped laser-guided bombs at the Utah Test and Training Range in Utah’s west dessert, marking the first time these weapons were employed by a combat-coded unit. In May, Hill’s F-35 pilots began flying routine four-ship configurations. Hill’s fleet of F-35 aircraft has also received lightning protection and anti-ice modifications, and pilots are now using the lightweight “Gen-3” helmet. The base is slated for three operational F-35 squadrons and a total of 78 aircraft by the end of 2019. The 388th and 419th FWs fly and maintain the Air Force’s newest fighter aircraft in a Total Force partnership, which capitalizes on the strengths of the active duty and reserve components.